names and phone numbers of the representatives. Below, you can look through the addresses we send you notifications to. Legal address is for filing documents. Business address is for the documents we prepare. Messages from your Merchant Profile are sent to the address of the main contact person. Our managers call and write to this person. 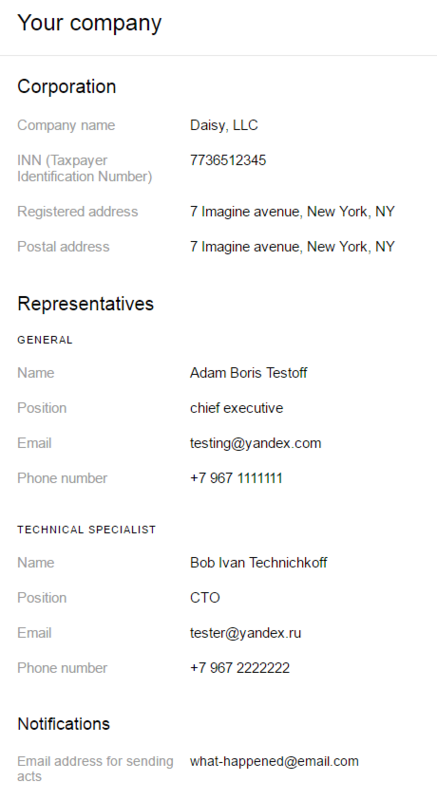 Messages concerning settings for work with Yandex.Checkout and any their alterations are sent to the technical specialist. Our technical specialists call to this person. Click a pencil icon on the right. You will see a form for changing parameters. Enter new parameters and push Save. Your request for alteration is made. Our manager will see your request and change the parameters within three business days. We send monthly acts of services rendered to the address for the acts. You can change this email address via our manager.